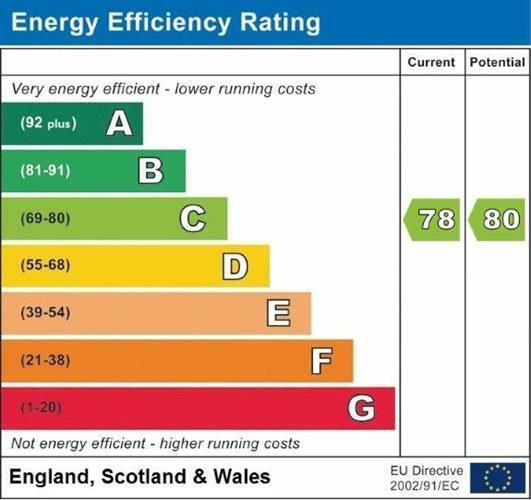 2 Bedroom Flat For Sale in Totnes for Offers in excess of £260,000. Located on the second floor of Leechwell Court is an impressive two bedroom spacious apartment with views across Totnes and surrounding countryside. 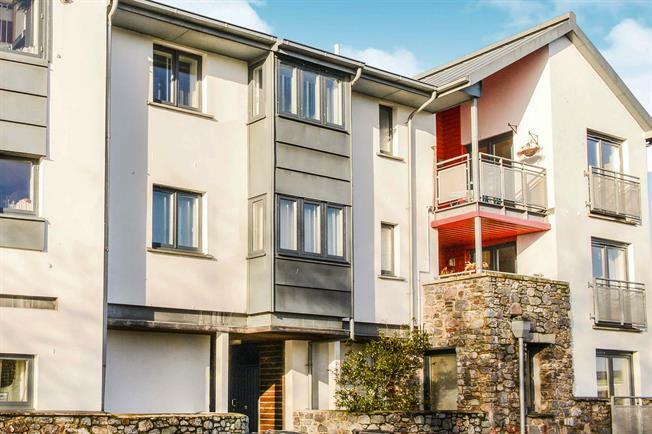 The apartment comprises of a modern kitchen with open plan lounge/diner, balcony enjoying views across Totnes, two double bedrooms one of which has an ensuite and a contemporary bathroom. The apartment also comes with a private parking space. Leechwell Court if located within walking distance to the town centre and of amenities. Coir entrance matting, flush downlighting, radiator and full height double glazed window with chrome and timber balustrade. Bamboo flooring. Two glass ceiling lights. Recessed LED floor lights activated by motion sensor and ambient light sensor. Radiator. Hallway cupboard housing incoming telecoms BT Openreach equipment, power sockets with two integral USB phone charging points. Two Cat. 5 Data cables (serving TV location in lounge) for network router. Kitchen has range of wall and floor cupboards and there are three glass display shelves. A 1½ bowl stainless steel sink with drainer and chrome mixer tap. Built in Bosch stainless steel gas hob and electric double oven. Built in fridge and freezer. Stainless steel splash panel and cooker hood for hob. Stainless steel light switches and power sockets. ‘Whole-house’ ventilation extract terminal in ceiling. Accessed from Kitchen area with two double wall cupboards, a range of floor cupboards, worktop with A 1½ bowl stainless steel sink and drainer with chrome mixer tap. Bamboo flooring. Open plan lounge/kitchen/dining area with access to covered balcony from two pairs of double glazed timber French doors. Panoramic views eastwards over Totnes to countryside beyond. Juliet balcony with inward opening double glazed timber French doors. Bamboo flooring continuing from hallway and extending into utility room. Three double panel radiators. Two ceiling lighting fittings. TV and FM Aerial socket. 5 data cables from hallway cupboard. Stainless steel finished power points. Balcony accessed from two pairs of French doors with the main roof extending over which keeps most of the balcony dry even during heavy rainfall. External light. Steel balustrade to balcony with painted timber cladding to walls and underside of roof. Double bedroom with large triple glazed bay window with views over Totnes and built-in timber desk within bay. Power points with USB charging points. Remote controlled electric roller blind. Built-in wardrobe. Radiator. White pedestal washbasin and close coupled WC. Large shower enclosure (1200 x 700mm), fully tiled with Mira Sport Max electric shower unit. Triple glazed window. Large built in floor to ceiling height wardrobe with aluminium framed frosted glass sliding doors. White steel bath with boarded bath panel. Pedestal washbasin with chrome monobloc mixer tap and close coupled WC. Tiled walls around bath and splashback to wash basin with modern ‘London Underground’ style tiling. High quality Grohe thermostatic mixer shower over bath with shower handset and drench shower options. Glass shower screen and panel. Two chrome towel rails. Parking space (owned under a separate lease included in the sale) in a car port accessed from courtyard. Courtyard accessed from Leechwell Street. Communal bike store and bin store. Communal entry phone system (audio) serving five flats. Communal stairwell. Mains gas, electric, water and drainage. Gas and electric meters in ground floor bin store. Water meter in courtyard. The service charge is £2500 pa. Lease remaining 988 years. The leaseholder is a shareholder in management company which owns the freehold.